When NASA’s Parker Solar Probe launches into space from the Kennedy Space Center, it will begin its journey to the Sun, our nearest star. The Parker Solar Probe will travel almost 90 million miles and eventually enter through the Sun’s outer atmosphere to encounter a dangerous environment of intense heat and solar radiation. During this harrowing journey, it will fly closer to the Sun than any other human-made object. 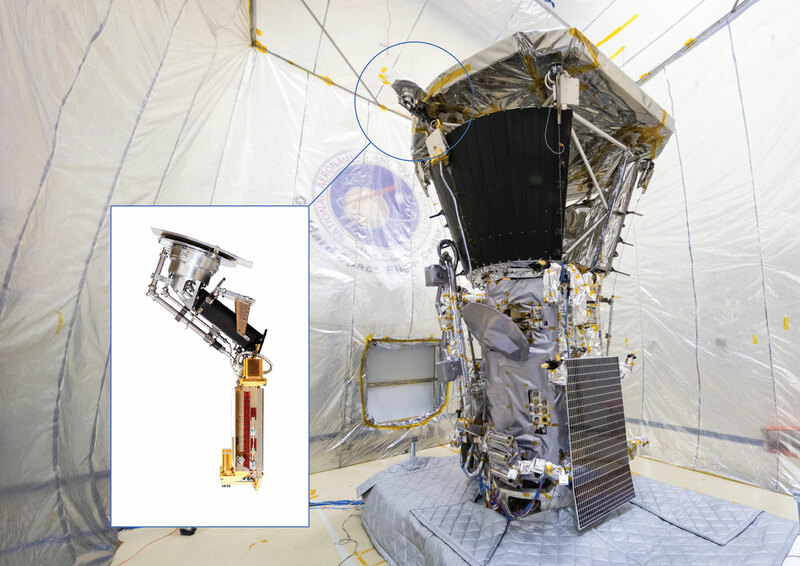 To revolutionize our understanding of our most important and life-sustaining star, scientists and engineers have built a suite of instruments aboard the Parker Solar Probe to conduct different experiments. Some of these instruments will be protected by a thick carbon-composite heat shield. However, others will be more exposed. The Solar Wind Electrons Alphas and Protons (SWEAP) investigation is the set of instruments that will directly measure the hot ionized gas in the solar atmosphere during the solar encounters. A key instrument on SWEAP called the Solar Probe Cup (SPC) was built at the Smithsonian Astrophysical Observatory (SAO) in Cambridge, Mass. The SPC is a small metal device that will peer around the protective heat shield of the spacecraft directly at the Sun. It will face some of the most extreme conditions ever encountered by a scientific instrument, and allow a sample of the Sun’s atmosphere to be swept up for the first time. The SPC uses high voltages to determine what type of particles can enter, which is a way of measuring the energy of the particle. This is crucial information for probing the wind of hot ionized gas that is constantly produced by the Sun. As the spacecraft flies towards the Sun for an encounter, the wind is directed straight into the cup. Without the SPC, Parker Solar Probe would miss most of what is in between Earth and the Sun. This unique probe of the solar wind is important for scientists to better understand space weather, which is responsible for effects that range from endangering astronauts on space walks to impacting the electronics in communications satellites. 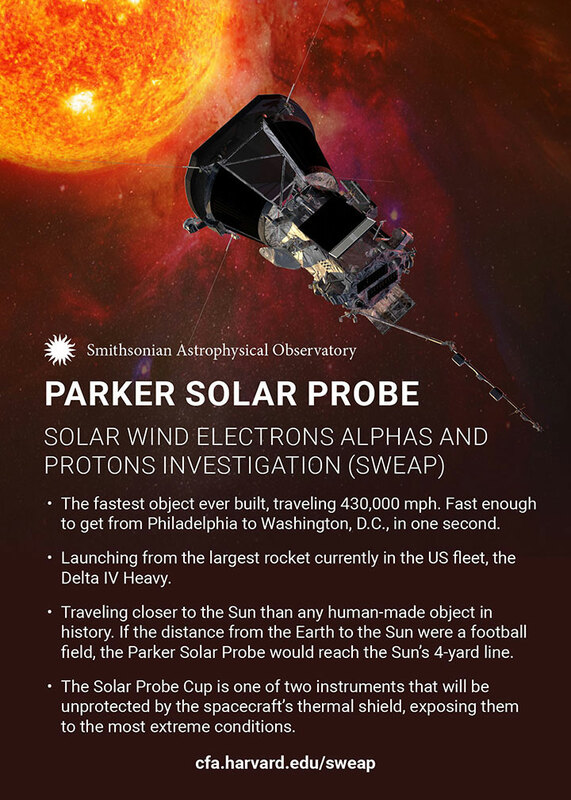 The Parker Solar Probe spacecraft, about the size of a small car, will travel towards the Sun’s atmosphere at speeds of about 430,000 mph (700,000 km/hr), becoming the fastest human-made object. Eventually, Parker Solar Probe will enter an orbit that approaches to within only 4 million miles from the star’s surface. (For context, the Earth averages a distance of about 93 million miles from the Sun during its elliptical orbit. Or, to put it another way, the spacecraft will travel about 96% of the way from the Earth to the Sun.) Parker Solar Probe, which will be carried into space by a Delta-IV Heavy rocket, is currently scheduled to launch on August 11, 2018. The SWEAP Team is led by Justin Kasper currently at the University of Michigan (and currently an SAO Research Associate). On the SWEAP Investigation, SAO partners with team members from University of California, Berkeley Space Sciences Laboratory, the NASA Marshall Space Flight Center, the University of Alabama Huntsville, NASA Goddard Space Flight Center, Los Alamos National Laboratory, and the Massachusetts Institute of Technology. SAO built the SPC (Instrument Scientist: Tony Case), leads the Science Operations Center (Head of Science Operations: Kelly Korreck), and manages the overall SWEAP program. Be the first to comment on "SWEAP Investigation Will Directly Measure Ionized Gas in the Solar Atmosphere"